Specially crafting colorants with the right properties for the project is a mainstay of our capabilities. 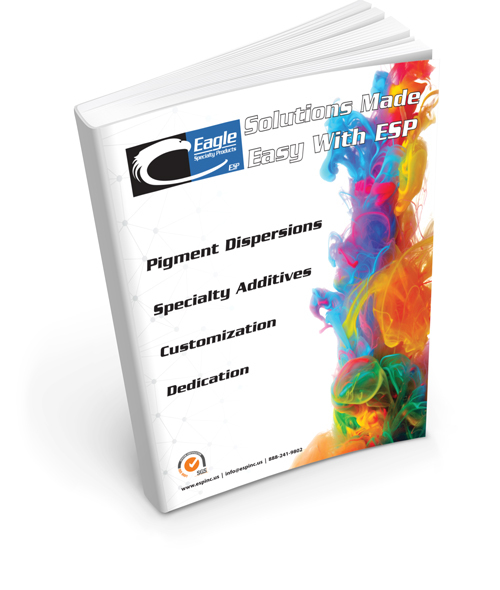 Our specialization in high-performance pigment dispersions engages our dedicated research and development team along with our skilled chemists to manufacture custom colorants to partner specifications. If you are in need of an offset to a current system, we also provide color matching. Our team will test your current colorant system for color stability and light-fastness, and can offset most colors to keep your product consistent in appearance and performance. Send us a sample of the color that you would like to match and we will develop a formula that meets the needs and conditions of your finished goods. Let Eagle make it for you. Our lab and production facilities can also accommodate toll manufacturing. We craft several products for partners in the coatings arena and we do it to their strict specifications. Our ISO Certified team of chemists and quality control specialists apply rigid criteria to any finished goods that we manufacture for other companies to ensure quality, consistency and value. Quality customized products demand knowledgeable, skilled technical support and service to reinforce them. With more than five decades in coatings sales, distribution and manufacturing, Eagle employs a dedicated crew of hands-on technical representatives. From chemists with 30 plus years of material sciences practice to sales and customer service representatives with long-standing coatings qualifications, we embed high standards into every facet of the customer experience. Get in touch with us and let us know if you are looking for something special. We can set up time to listen, pair you up with a technician and work toward crafting the perfect solution.